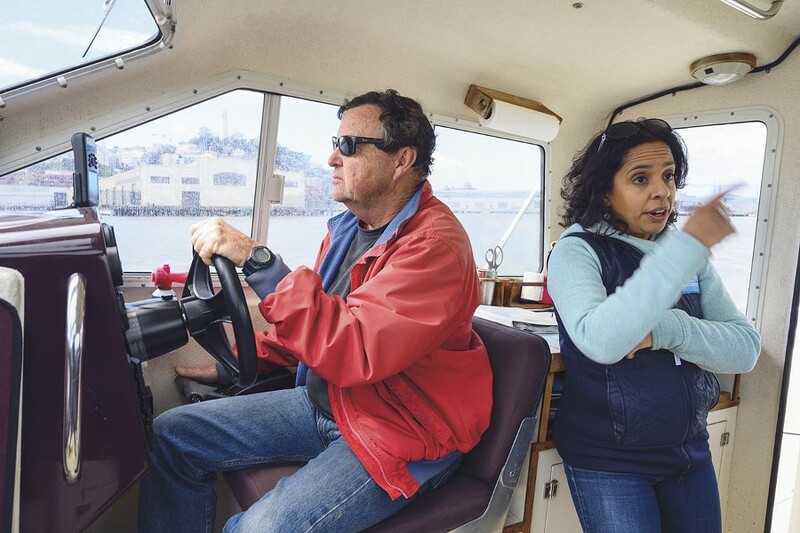 Volunteer skipper Robert Fairbank and Baykeeper Executive Director Sejal Choksi-Chugh, who joined the organization 17 years ago as an environmental attorney. Fishers are warned not to eat their catch. 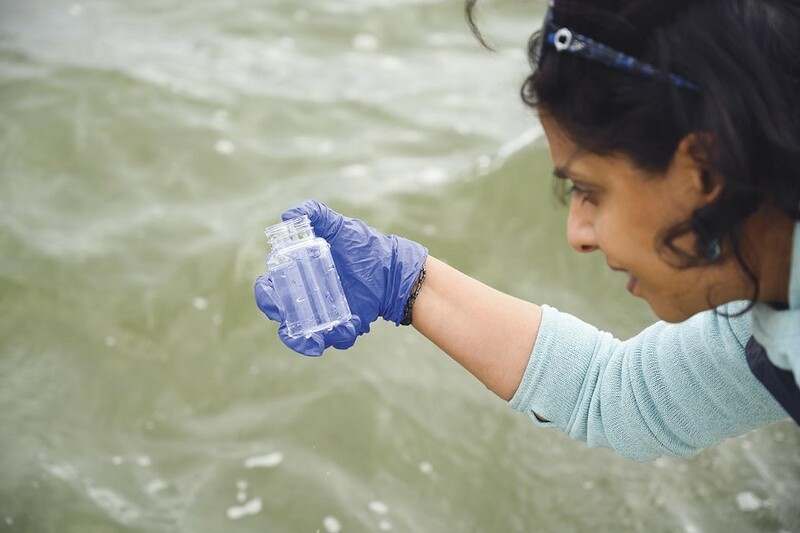 Choksi-Chugh takes a water sample from the bay. 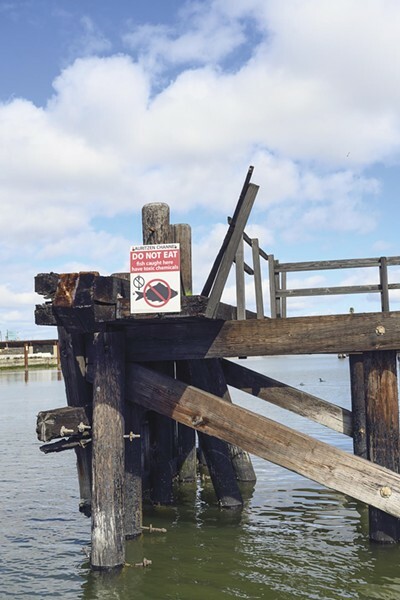 Photo by Ingrid Taylar CC For years the Ghost Fleet in Suisun Bay was a big source of pollution. Photos by Lance Yamamoto Human waste from liveaboards is less of a problem than the subsea disruption caused by their anchor chains. Photos by Lance Yamamoto Choksi-Chugh and Fairbank share a lighter moment. Photos by Lance Yamamoto The coal piles of Levin-Richmond Terminal and the cranes of Manson Construction. The greenish brown water laps at walls of concrete on each side of the estuary. 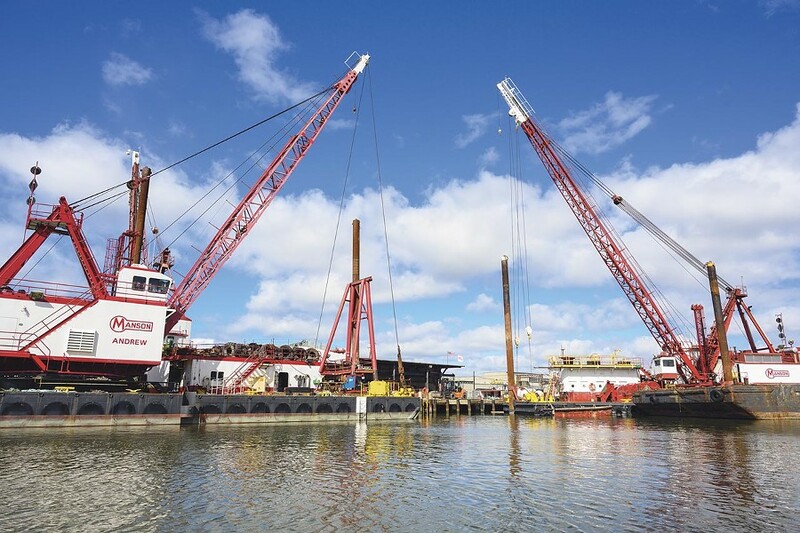 On the west is the waterfront property of Manson Construction, a marine construction and dredging company that has stacked a paved site with cranes and shipping containers. Along the east side of the narrow inlet are Levin-Richmond Terminal, a Union Pacific coal depot, and Plains All American Pipeline, a Houston-based crude oil shipper. Together, these companies and several others have helped created a unique aesthetic in this remote corner of San Francisco Bay. 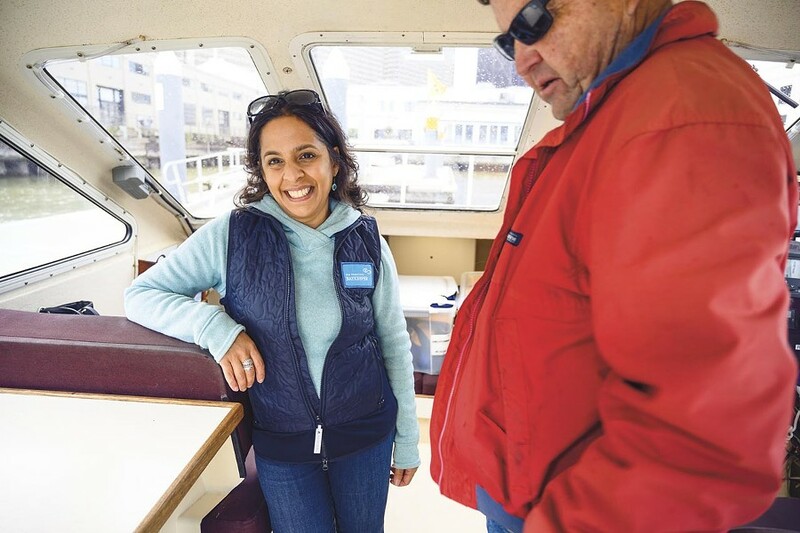 "This is the ugliest part of Richmond," says Sejal Choksi-Chugh, as she steps out of the cabin of a small boat patrolling the waterway, known as the Lauritzen Canal. Her observation is generous. This may be the bleakest shoreline in the Bay Area, and it isn't just the industrial infrastructure that gives character to this place. Floating trash has collected along the docks, and the waters are contaminated by the loading and unloading of vast amounts of fossil fuels. A sign posted to a piling warns fishers not to eat anything they catch here. A murre dives underwater as the 24-foot vessel putters past, and other seabirds stand perched on the docks. In the winter months, herring sometimes spawn near the mouth of this canal, and contrary to appearances, the marine ecology here has not been entirely consumed by things concrete, steel and chemical. In other words, there's hope, and that's partly why Choksi-Chugh is here. 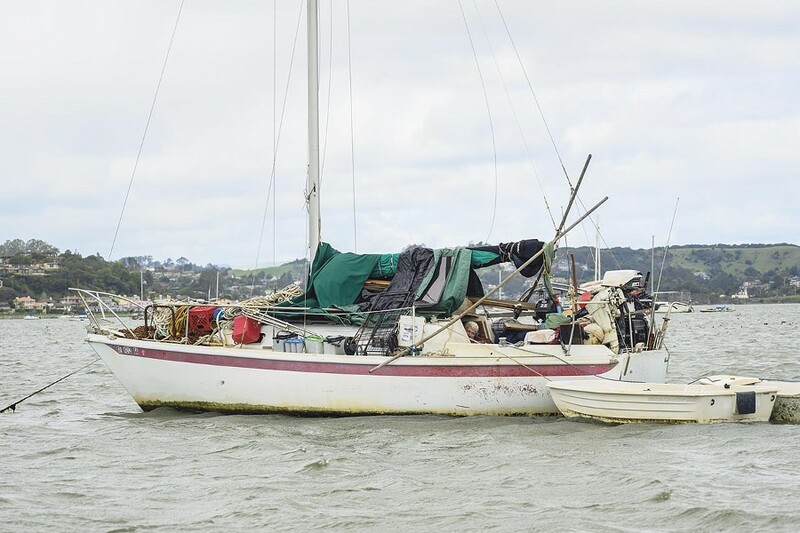 She is the executive director of San Francisco Baykeeper, an environmental watchdog based in an office in downtown Oakland but known better for its field investigations on the Bay itself. "We're the eyes and ears on the water," she said. The organization also keeps a strong presence in court. Founded in 1989 and supported by public and private donors, Baykeeper has earned a reputation as one of the region's most active and most effective defenders of the marine environment. 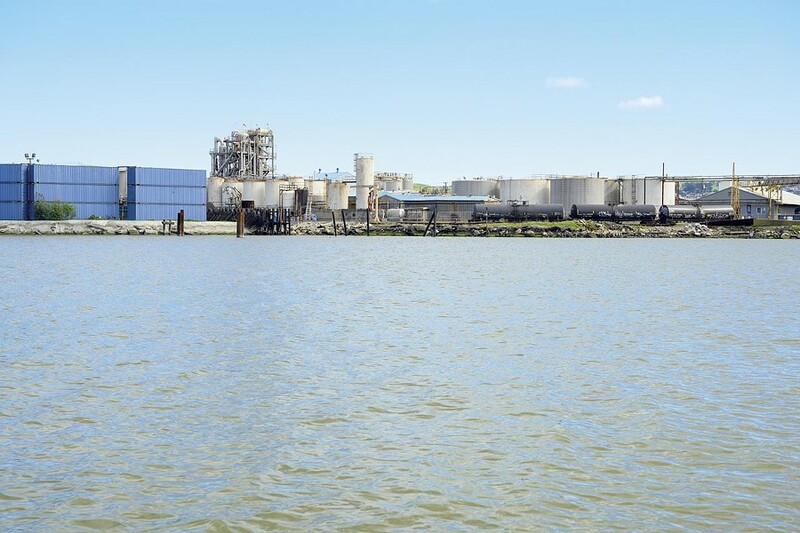 More than 270 times, Baykeeper has identified polluters in action — often cities that chronically discharge trash and raw sewage into the water — and taken them to court and seen them penalized for violating the federal Clean Water Act. 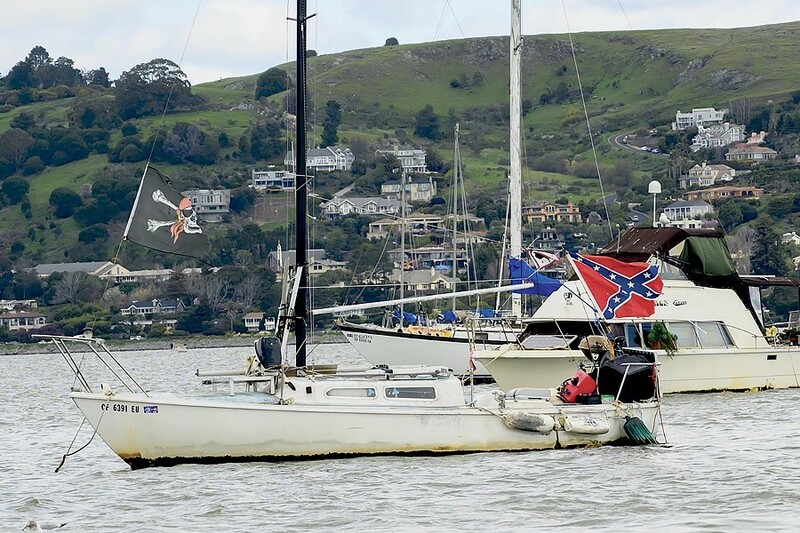 One day in 2012, the organization's namesake boat, the San Francisco Baykeeper, entered the Lauritzen Canal on a routine patrol. Choksi-Chugh was not onboard that day, but her colleagues saw piles of coal, as well as coke, a coal derivative, tumbling into the water as operators of the Levin-Richmond facility transferred the material onto a conveyor leading to a moored ship. "It was falling through the pier, and it was falling off their conveyor system," Choksi-Chugh said. So, Baykeeper sued the company. Defense lawyers would argue that dumping coal products directly into the water was perfectly legal. However, Baykeeper — essentially a team of scientists and attorneys — pressed their case and won. 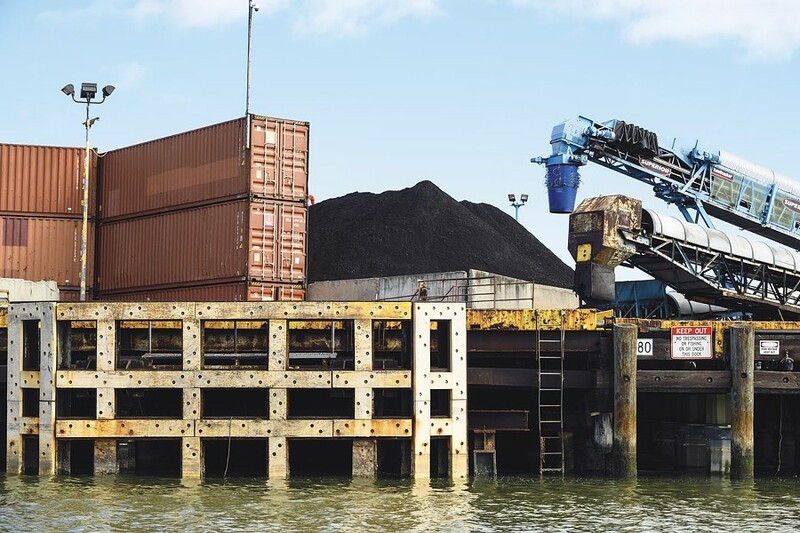 In a 2014 settlement, Levin-Richmond agreed to cover and contain its coal piles to keep toxic materials from blowing or falling into the water, and to halt activity during windy conditions. In 2018 alone, Baykeeper forced action against 23 industrial facilities that had been illegally contaminating the Bay, and the nonprofit's growing resume of legal victories amount to a great success story. However, the fact that the organization exists at all indicates a taxpayer-funded system that isn't quite working. Baykeeper's primary job is to do the work that law enforcement officials and staff at various state and local agencies evidently are not doing themselves. "Agencies aren't doing their jobs, and that's why we're here," said Choksi-Chugh, a 42-year-old who joined Baykeeper 17 years ago as an environmental attorney. She is now well known in the industrial, agency, and NGO communities. This is often a matter of short funding or lack of staffing. 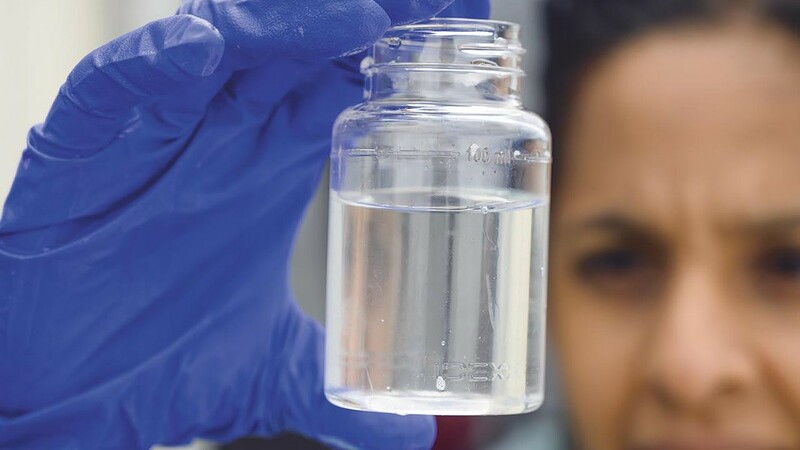 "Frequently, there will be one inspector responsible for ensuring compliance of tens of thousands of businesses that regularly discharge wastewater to the Bay," said Miriam Gordon, the program director for the organization Upstream Solutions. Public officials don't necessarily disagree. "State and local government are inadequately funded to deal with this problem," said Thomas Mumley, manager of the San Francisco Bay Regional Water Quality Control Board, the agency tasked with protecting waterways against pollution, and with which Baykeeper works closely on a routine basis. Mumley said the role of nonprofits in closing the gaps in environmental laws is an important part of the system. "The presence of third parties is well recognized now by the regulated community," Mumley said. "They know they're being watched, and this does help." The Bay Institute, the Sierra Club, the San Francisco Estuary Institute, the Natural Resources Defense Council, the Golden Gate Salmon Association and the Center for Biological Diversity, among other groups, all play roles as environmental guardians, but perhaps no other group pursues violators of San Francisco Bay, in the field and in court, as doggedly as Baykeeper. Recently, Mumley's agency issued a cease-and-desist order against Caltrans to mitigate roadside trash accumulation, as trash discarded along highways often winds up in waterways. This order comes as the same agency advances an initiative to rid the Bay Area's waterways of trash by 2022. By this summer, dozens of cities are required to have cut their pollution by 80 percent from 2009 levels. As this ambitious, if not impossible, deadline approaches, other challenges are mounting before regulators and supporting organizations like Baykeeper. "Invisible pollution is starting to become much more of a problem," Choksi-Chugh said.